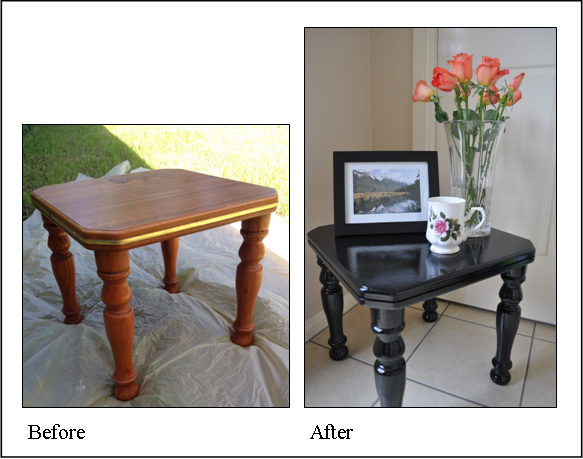 before & after – MY DECORATOR – Helping you achieve your interior designing dreams! 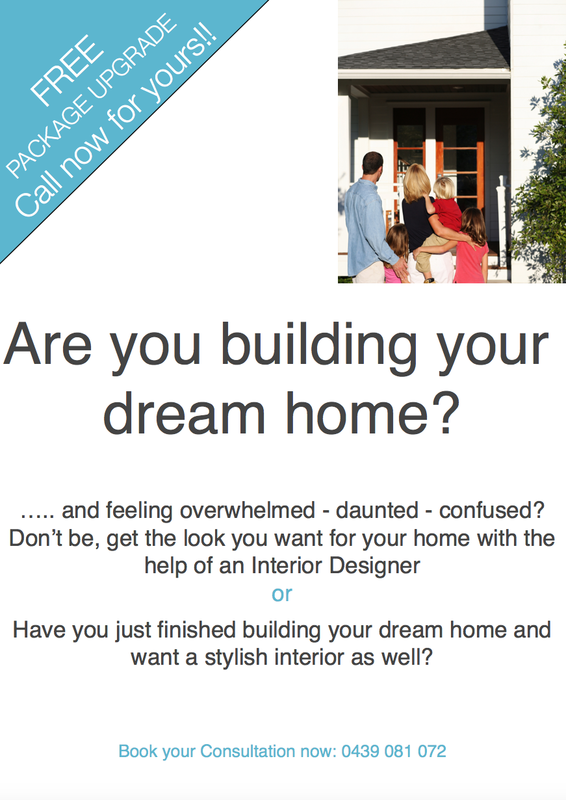 Colour consults, property styling. We’ve had this tired looking but cute little side table put aside for the next council pick up but mid last week I decided I would give it a fresh new look. I already had a tin of black gloss enamel paint that needed using up so that was the colour and paint decided. Although enamel can mean a messy turpentine clean up, I knew it would be worth it in the long run. 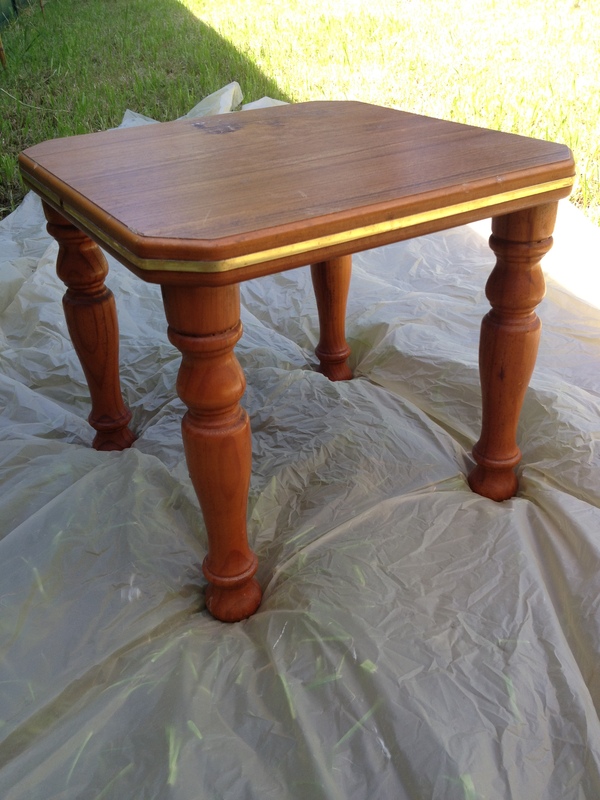 The following steps apply to painting any piece of wooden furniture. 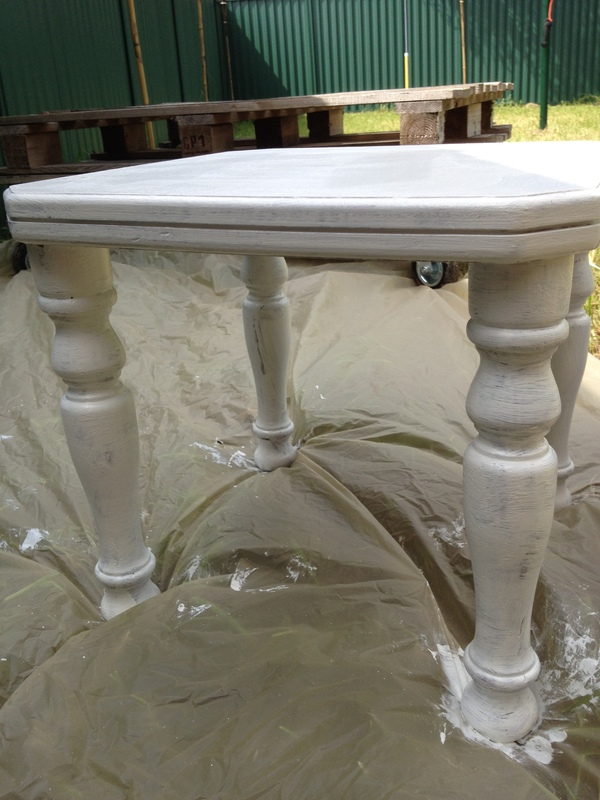 Step 1 – Have a look at the surface area of the piece of furniture you are going to be painting. If its glossy with varnish or sealed wood the best thing is to sand paper the piece with 100 grit sandpaper. I definitely had to do this with my piece as it had a wood varnish on it. If your piece is unfinished wood or already has been painted with a flat paint finish you don’t need to do this step at all. Step 2 – Use a brush to paint on some oil-based primer (you don’t have to paint this on perfectly, just make sure you cover the whole piece), this helps the paint stick and also ensures no stains come through and ruins your finish. Wait for it to dry. Step 3 – Use a new paint brush (especially if like me you are painting with enamel) to apply your chosen paint. Note a semi-gloss is the most practical and hard wearing choice. When you’re painting it’s best to do many thin applications then few thick drippy ones, you will get a much smoother finish. Wait the recommended dry time (it took 7 hours for enamel, but really worth it) acrylic is a lot faster and then do another coat or three. Tip: I often glad wrap my brush between coats, the glad wrap keeps the moisture in and it saves time cleaning in between. Step 4 – This step is optional. If you are painting your dining table you may opt to paint a couple of thin coats of clear gloss for extra durability and protection. 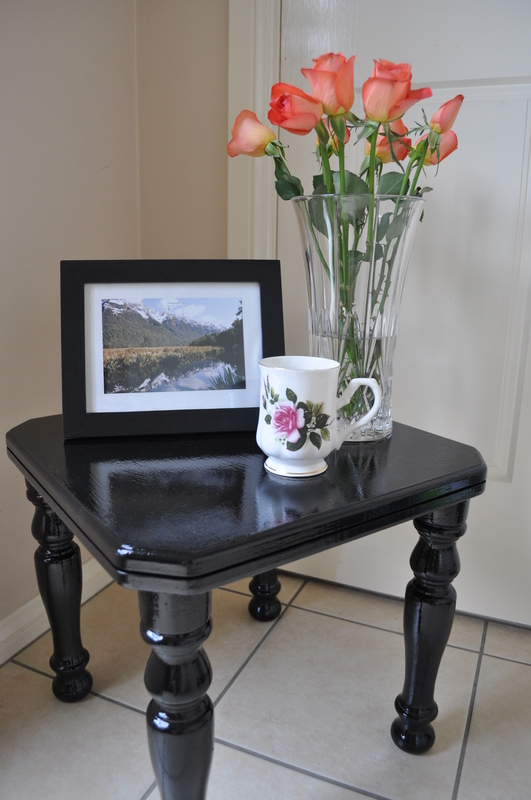 I didn’t do this with my side table as it isn’t going to be used on a daily basis. 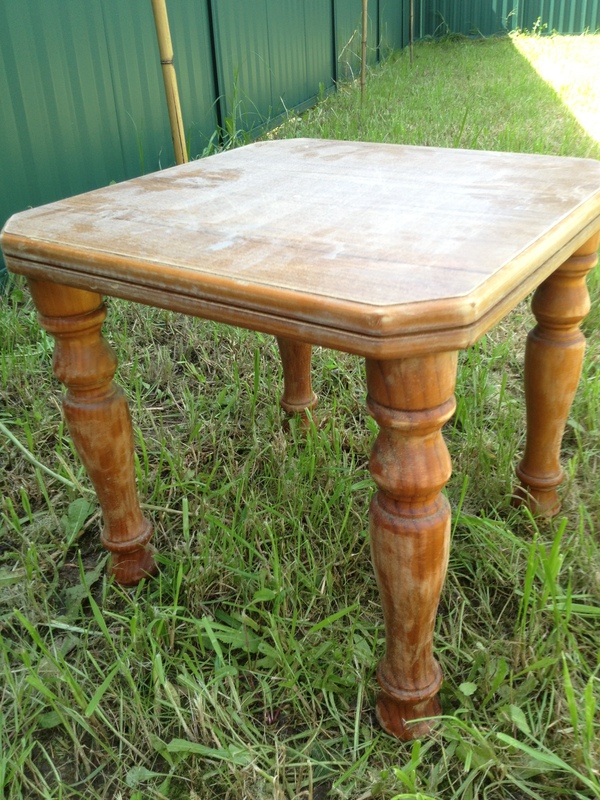 Step 5 – Wait 3 to 5 days or more until you put your item to use, especially table tops. I waited 4 days until I used mine, this is to avoid any dents or scratches and allows time for the primer, paint and gloss to cure as sometimes the weather (humidity in particular) can slow this process down. Be patient, it will be worth the wait, trust me. So get into some D.I.Y. 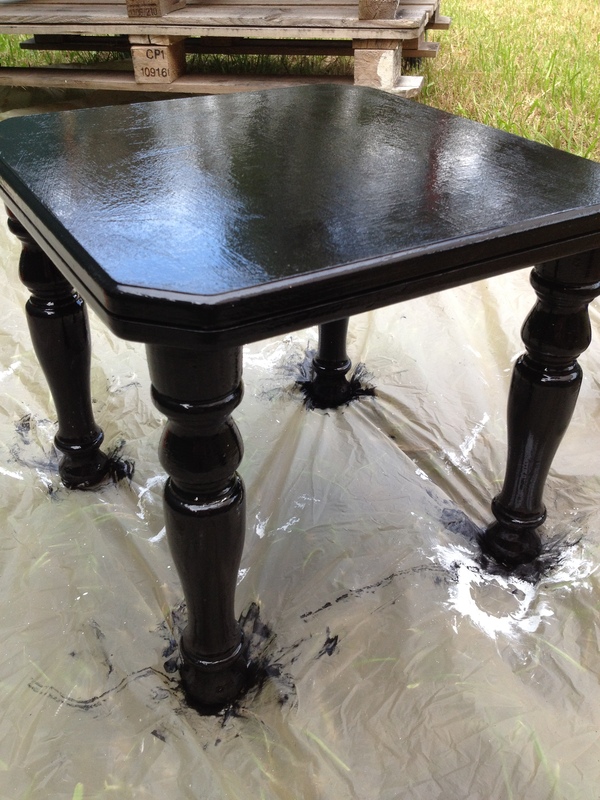 today, maybe today is the day to paint that old piece of furniture after all!